This site is a tribute to my dad, Al (Ace) Blixt, who photographed and wrote about auto racing in the midwest from the 1920's to the 1950's. I have also included some of my own racing photos from the 1960's. -- Al Blixt, Jr.
Frank Lockhart - "The greatest of them all." 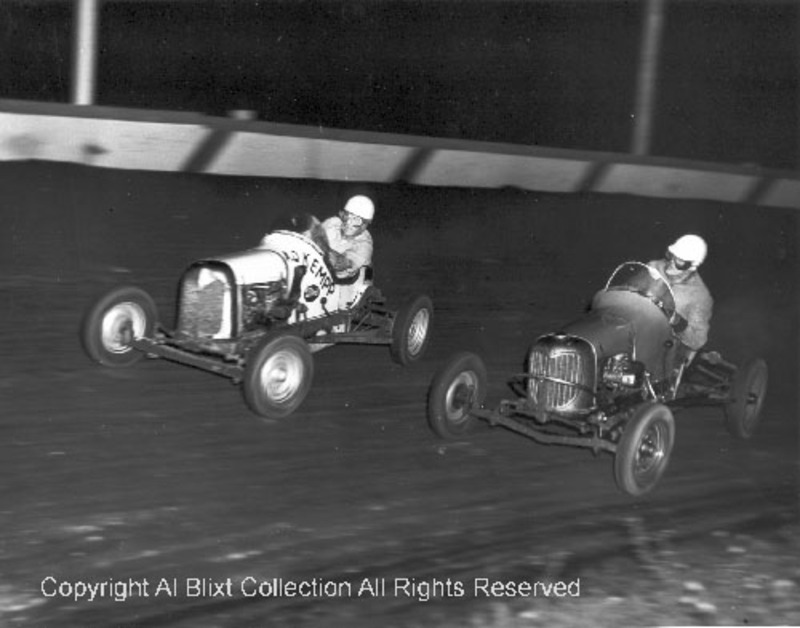 These are auto racing photographs taken by Al Blixt, Sr. in the 1930's. They are presented here for your viewing enjoyment. Please feel free to download these images for your own personal use. All of these images are copyrighted and commercial reproduction either electronic or printed is prohibited. Wally Zale was a great driver who set records for wins all over the Mid-west in the 1930's and early 40's. He was part of the "Chicago Gang" that included Tony Bettenhausen, Paul Russo, Jimmy Snyder, Cowboy O'Rourke and Emil Andres. 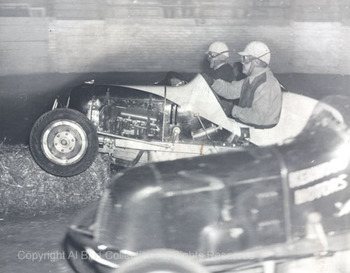 Pictured here are Wally and Harry Hart at Detroit's Motor City Speedway in 1937. To learn about his short but brilliant career, read on. This headline from December 15, 1939 tells a story that was repeated hundreds of times between 1934 and 1942. 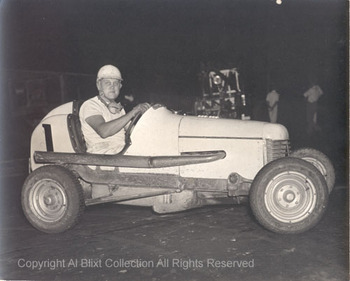 He was a pioneer of midget auto racing from the time it was introduced in the Mid-west. His biography in the National Midget Hall of Fame says, in part, "His 67 wins with various organizations in 1940 is believed to have been the greatest number ever by a midget driver in a single season and broke his old record of 65 feature wins set in 1936. A member of the famous “Chicago Gang,” Zale won the Milwaukee Fairgrounds Championship in 1935. The next year he captured both the Walsh Stadium crown in St Louis and the Detroit Motor Speedway title. In 1939 he took the Riverview Championship in Chicago and repeated again in 1940. He also took the Detroit Coliseum title that same year. He won the Chicago Amphitheater Indoor title in 1941 as war clouds threatened the nation." Walter Zale was born in Chicago in 1905 . His parents were Lithuanian. I don't know anything about his early life but his racing career began in the late 1920's. In 1931, he was entered at the Indianapolis 500 in a car that did not qualify owned by Charles H. Burk. When midgets were introduced in 1934, he made the switch to the little doodlebugs and never looked back. He was a regular at perhaps dozens of tracks in Illinois, Wisconsin, Indiana and Michigan. Shown here in 1940, Zale's car rightly bears the #1 of a champion as he captured an astonishing 67 feature wins that year. Wally, like many other drivers, raced year 'round. Indoor racing was very popular in the 1930's. Zale could be seen throughout the late 1930's every week from November to April every Saturday night at the Michigan State Fair Coliseum in Detroit. This one-seventh mile concrete oval was part of a regular indoor circuit for midgets including the Chicago Amphitheater. Here Wally climbs a hay bale with Art Hartsfeld in the background in 1935. Wally was a very popular champion and a big draw wherever he raced. This clipping, probably from early 1941, appeared in one of the Detroit daily newspapers and testifies to Zale's drawing power. Considering that there was to be a field of 50 cars and drivers, the fact that Wally's picture appears above the story tells you how popular he was in Detroit. Indoor racing was very demanding and dangerous. A 200 lap race indoors on a tight 1/7th. mile track is certainly a tremendous physical challenge. Imagine the exhaust fumes alone. Yet, crowds of about 5,000 turned out weekly to see these races from 1935 until the war ended racing for the duration in April 1942. Wally Zale's life also ended that month as you will learn below. 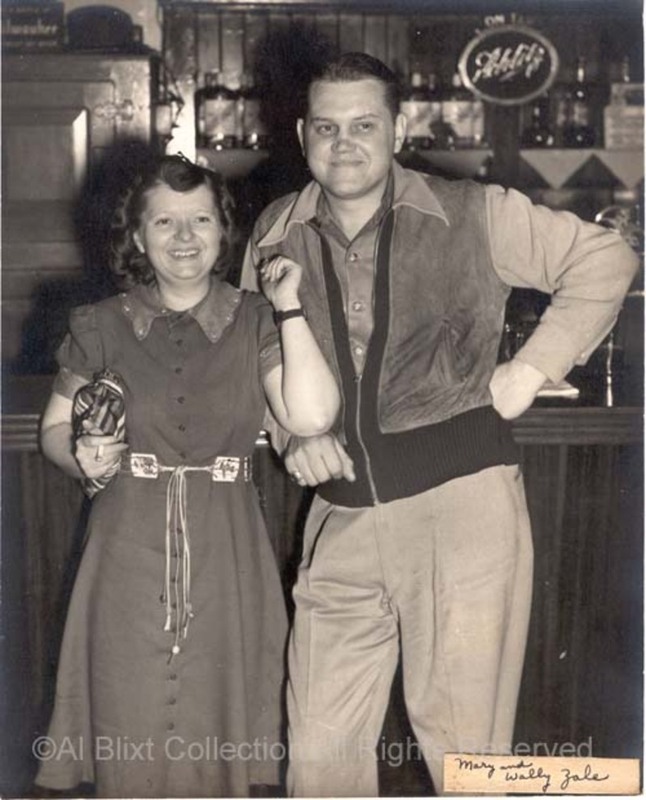 Here we see Wally (in that same sporty two-toned jacket) with his wife Mary in 1941. I don't know anything about Mary. Perhaps some of you readers can add some details. However, they do look happy. Life on the road was pretty basic in 1940. Racing six nights a week meant spending a lot of time in tiny tourist cabins like these near Grand Rapids, Michigan. Pictured here, according to the note on the back of this print in my dad's handwriting, are (left to right) Jim Tripplett, "Dago", Duke Dinsmore and Wally Zale. Dinsmore and Zale were well-known drivers. I have no information about the other two men, although there is a good chance that "Dago" refers to Frank Perrone, another Chicago midget driver (see below). Everyone traveled light hauling their race cars on simple trailers. 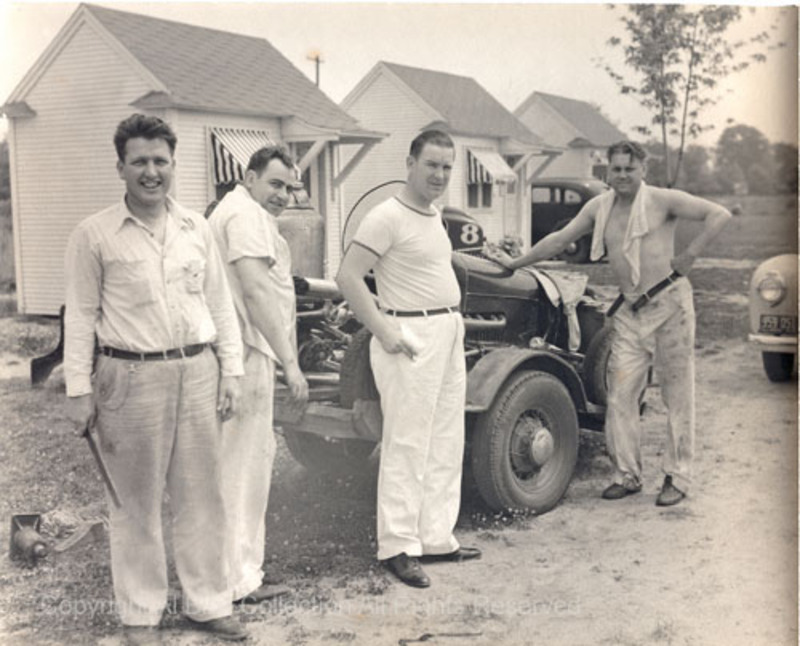 These drivers were, no doubt, headed to Bigelow Field, a race track built on a converted baseball stadium in Grand Rapids by Don and Carson Zeiter. One can only surmise that driving to the "next town" each night after the races and the resulting fatigue could have been a cause of the terrible accident that ended the life and career of Wally Zale. 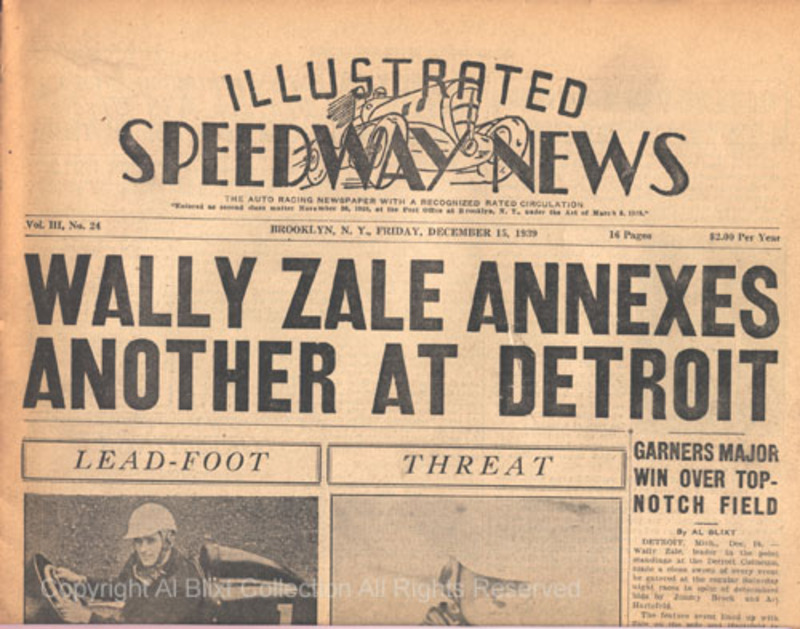 Wally Zale died tragically on April 25, 1942. This clipping was in one of my dad's scrap books. It is not entirely clear as to how the accident happened. An entry on a racing forum by Rick Kelly of Oklahoma City, reads as follows: "According to the Associated Press and Sgt. Anton Paulus of the Cook County Highway Police, scrambled with he Tribute Project's and National Midget Hall of Fame's pages on Wally Zale, I think the accident happened when Zale felt he could ignore the red flashing RR crossing lights because he could beat the train he saw coming from the south. Unfortunately, he did not see the train coming from the north, which hit his car, dragging it for a block until the other train hit the car." The fact that he was traveling at night with another driver, Frank Perrone, is an indication that Wally was just trying to make it to the next town after a night of racing. Readers who can add to the story of this great driver are invited to comment. I will update this feature as new information becomes available. I remember being dragged to the Farmer City IL track by my father to watch Wally Zale, Cowboy O'Roarke, Shorty Sorenson,and Bob Mulke, Wally was always a gentleman and Bob Mulke was a terror on wheels with his outboard. How I would love to go to a track and smell the castor oil again.